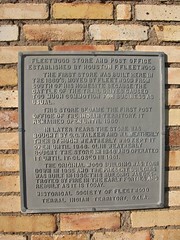 The first store was built here in the 1880's, moved by Fleetwood from south of his home site because the cattle of the trail drive caused too much commotion for business as usual. This store became the first Post Office of the Indian Territory. It remained open until 1980.
in later years the store was bought by O. C. Walker and W. L. Weatherly then by Hugh Weatherly who kept it open until 1946. Olin Weatherly bought the store in 1946 and operated it until it closed in 1981. The orginal wood building was torn down in 1935 and the present building was built in 1935. This building was destoryed by fire in the early forties and rebuilt as it is today. Terral Indian Territory , Okla.
Highway US 81 at Terral, Ok turn east on Apache, follow road, road turns into Fleetwood Rd. go about 4 miles. 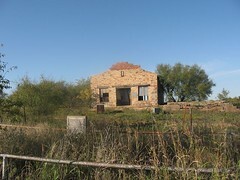 Store and marker on north side of road. Note: Two more marker are located on east to the end of road, markers are on the south side of road.